Tickets have sold out ~ 4th Jan 2019! 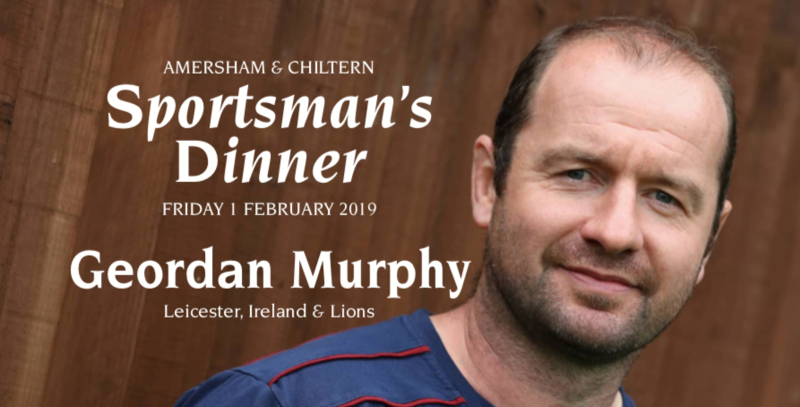 On the eve of Ireland v England Six Nations, Geordan Murphy is our Guest of Honour. He was born in Dublin, with six brothers and a sister who all played rugby. In 1997 he joined Leicester Tigers, where he spent his entire professional career. Playing at full back or wing, he made 316 appearances including an astonishing 8 Premiership Champion titles, as well as twice Heineken Cup Champions. He was awarded 72 caps for Ireland, including the 2009 Six Nations Grand Slam. He won 2 Test caps for the British & Irish Lions in New Zealand in 2005, which featured the infamous O’Driscoll spear tackle. In 2013 Geordan joined the coaching staff at Leicester Tigers and at present is Interim Head Coach. But, for all lovers of rugby, it was the style and attitude in which he played that we all so admire. In addition, by popular demand, we will soon announce a ‘top of the bill’ comedian to entertain and amuse us during the evening. Tables of 10 are £550 or individual tickets at £55 per person. Doors open 7:30pm; lounge suit or blazer and tie. or post cheques, payable to A&C RFC, to Peter Osborne, Trafford House, Martins End Lane, Great Missenden, Bucks HP16 9BH. After paying, please advise Peter at posborne@osbornesamuel.com. Contact Pierre Nayna pierrenayna@btinternet.com for event details.